Cromwell's Tower on Tresco, Isle of Scilly. Built c. 1651 (see www.vauban.co.uk/kingdoms-under-siege for further information). The military history of Western Europe in the 17th century is dominated by the Thirty Years War, the Wars of the Three Kingdoms (misleadingly, but commonly, known as the ‘English Civil Wars’), and the wars of Louis XIV. The common perception of these conflicts is of big battles: cavalry charges on the wings whilst in the centre, massed infantry formations slugging it out. Yet the reality is rather different as it was the siege rather than the set-piece battle which dominated 17th century warfare. King's Lynn's 1643 defences by the Red Mound. During the Civil Wars there were more than 300 sieges of various kinds and in the first year of existence, the New Model Army fought just two major battles but conducted 12 sieges and storms. Prince Rupert, a commander with a reputation for seeking battle as a first resort, participated in twice as many actions involving attacking or defending strongpoints as he did battles. Christopher Duffy described the conflict as “a war of trenches, ramparts, palisades, bombardments and blockades”. The Civil Wars actually started with the storming of Edinburgh Castle in 1639 and ended with the fall of Dunottar Castle in 1652, whilst Oliver Cromwell’s Irish campaign of 1649-50 comprised nearly entirely of sieges and assaults. 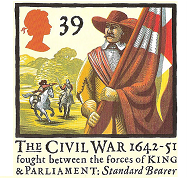 The first ‘English’ Civil War started with an attack on Hull in July 1642 (although there is a case for the first being Parliament’s capture of the Tower of London in January 1642 being the start), and ended with the fall of Harlech Castle in March 1647. Entrance to Leith Citadel, one of the Cromwellian citadels built in Scotland during the 1650s (see www.fortified-places.com/leith/ for further information). Image copyright David Flintham. The coup de main, where surprise was used (such as Alexander Leslie’s capture of Edinburgh Castle in 1639). The ‘smash and grab', where an assault was launched after a preliminary bombardment, a preferred tactic of the New Model Army (and on at least one occasion, at Dartmouth Castle in 1646, the assault was launched without any bombardment). Here, just the threat of the assault was often enough to persuade the garrison to surrender. The blockade, which was a longer-lasting affair, and the besieger invested the place of strength, preventing communication and offensive activities by the garrison. This was the preferred option by an attacker unwilling (or unable) to attempt an assault and was used (without much success) by the Royalists at Gloucester, Plymouth and Lyme Regis. Finally, and quite uncommon was the complete investiture, where a circumvallation of rampart and ditch, fort and battery would be constructed around the entire town, in so doing cutting it off from the outside world. Examples of this are few: Newark (1645-6), Oxford (1646) and Colchester (1648). Deal Castle, built by Henry VIII and defended by Royalists in 1648 (see 'Tudor Wall' Military History Monthly, No. 63, December 2015). Despite their importance, studies or sieges and fortifications are relatively uncommon and so to help raise awareness of the sieges and fortifications of the civil wars, and to create a home for my on-going research into the sieges and fortifications of the 17th century, I recently launched www.vauban.co.uk. Here, you will find pages devoted to London’s Civil defences, sieges and fortifications of the 2nd and 3rd Civil Wars, together with a page devoted to the greatest military engineer, Sébastien Le Prestre, Seigneur de Vauban, after whom, the site is named. David Flintham FRGS is a military historian specialising in 17th century sieges and fortifications, and has been interested in the 'English' Civil Wars for virtually all of his life, an interest ignited by seeing the 1970 film, Cromwell. He is a graduate of the ‘Partizan Press school of ECW studies’. A fellow of the Royal Geographical Society, he writes regularly for the Fortress Study Group and is a regular contributor to Military History Monthly. He is the author of two books, several academic papers and a number of popular articles, and is regarded as an expert on London's civil war defences. He is currently writing his third book, Civil War London. London under Charles I and Oliver Cromwell, due to be published by Helion and Company at the end of 2016.